This is what I have been on working on today. A new miniature collection of dollhouse paintings. These new paintings have a style that could be called a sign or plaque, this type of retro styling is very popular and the twist here is they are each a unique one of a kind piece of art. 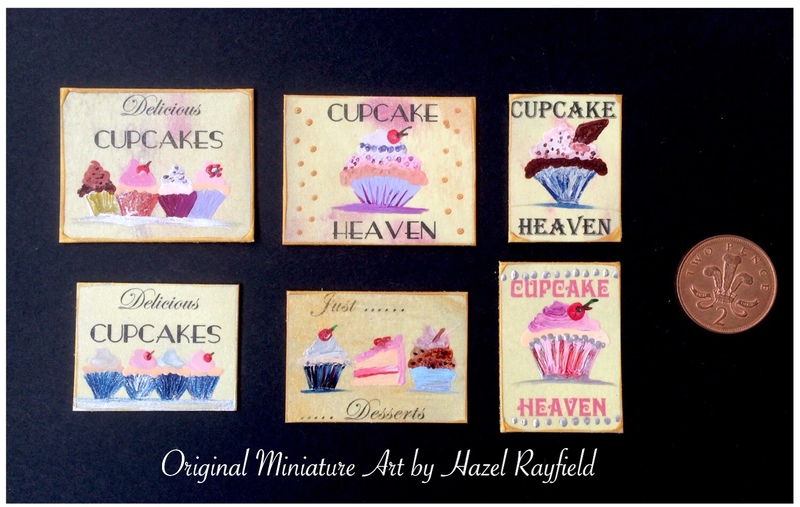 They are mixed media with a sweet treat theme…… I like a cupcake myself ! I have in the past dabbled in using my Encaustic paints with other media and these new miniature paintings are a combination of ink and encaustic Wax paint. I used my computer and printed the ink lettering into a semi sheen (and semi absorbent card) then wax painted over the printing, this seals the print into the painting and then I paint the picture, in this case a theme of cupcakes and desserts. These are each a unique original painting. Only the text is printed. Shown here on display in my Osn miniature property The Gallery which is my 1:12th Art Gallery. Last weekend I went to the Rayleigh Dolls House Fair, shopping not selling. I have had a stand at the Dolls House fairs at The Mill in Rayleigh in the past but I haven’t done fairs in 3 years now and sell my work online or by direct contact and commission only now a days. 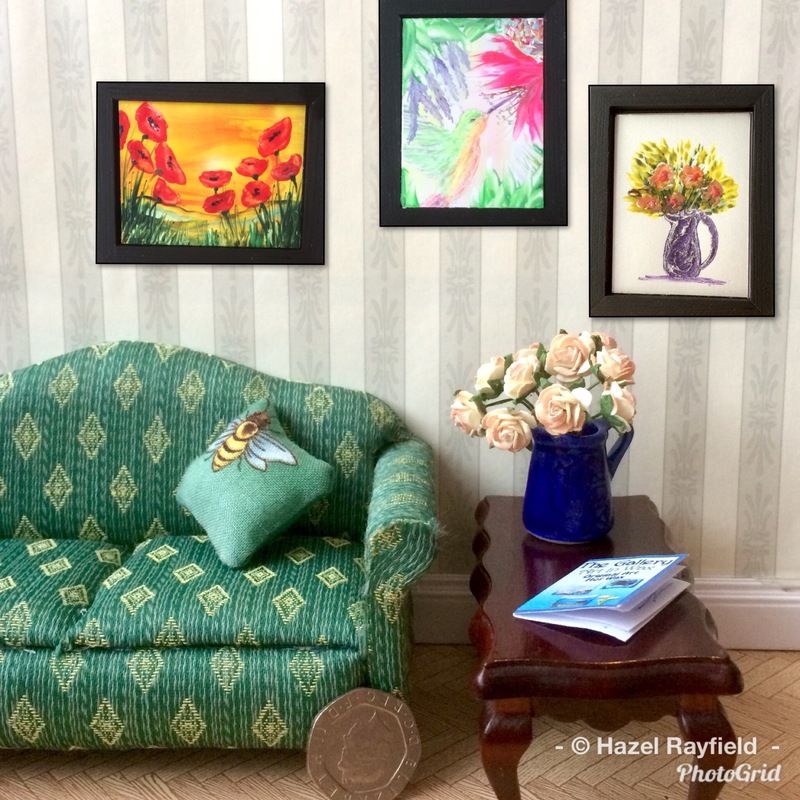 I like to show my paintings in the best way possible when displaying them for sale online. I often take photographs in my own 1:12th Art Gallery or in my 1:24th scale set. And I thought it might be fun to make a room setting as a lounge to show how they might look displayed on the wall. There were some wonderful stalls at the fairs and I managed to get these and a few other bits and pieces including some new frames too. 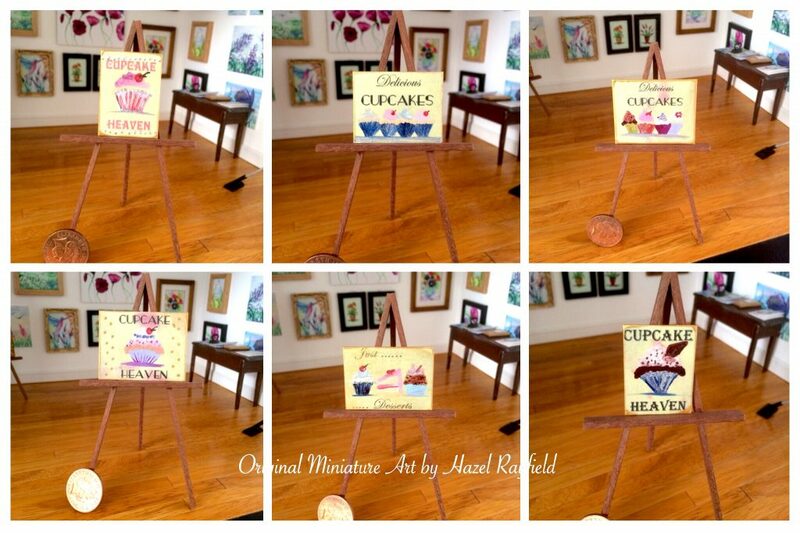 These are my latest miniature paintings….. The two fairy Godmother paintings and Moonbeam and Christmas Fairy are listed in my Etsy Store from today. 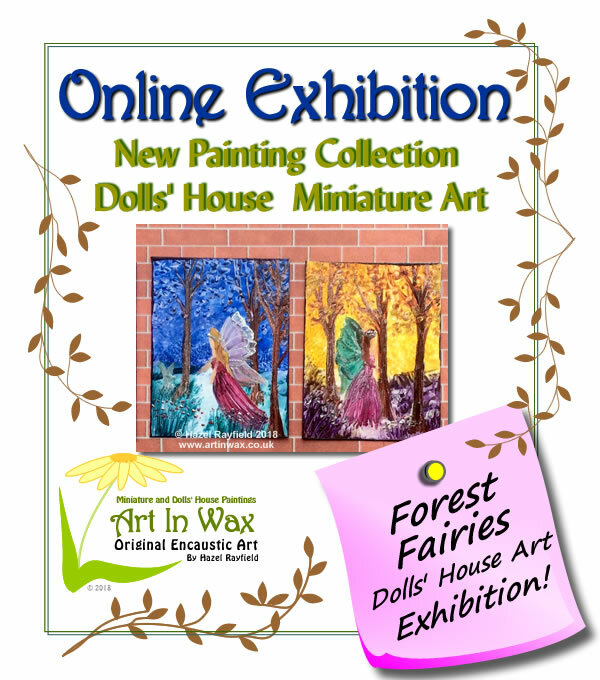 The Art In Wax Exhibition Page has a new Exhibit today : Forest Fairies. The new exhibition has 6 miniature dolls house size paintings, in a wooden, forest setting. 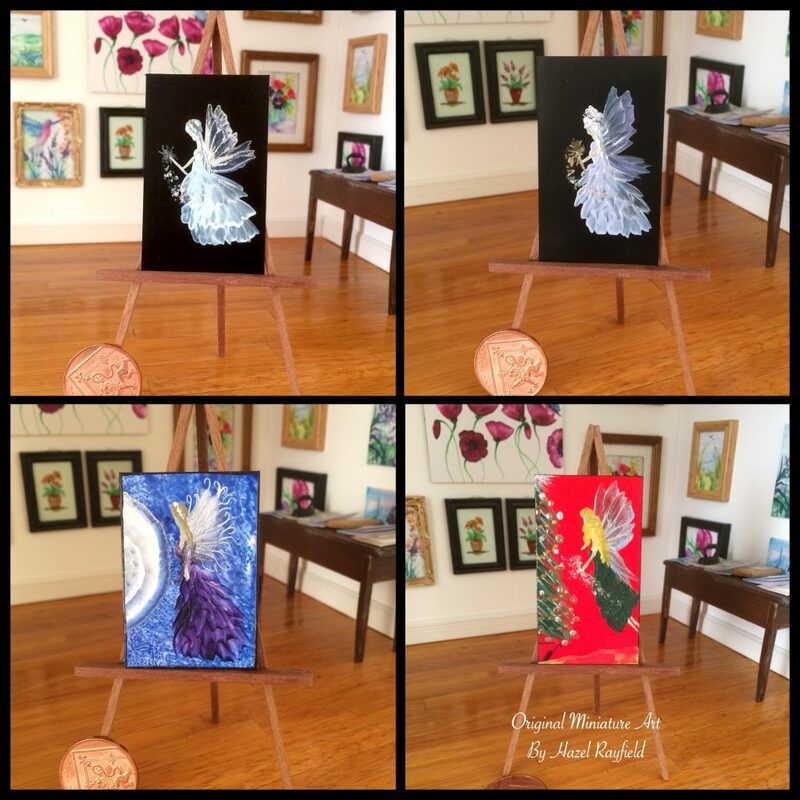 Each of these fairy paintings are original miniature encaustic wax paintings, there are four paintings sized 1 x 2 1/2 inches, which are popular for 1 12th scale dolls houses and two paintings at 1 x 1 1/4 inches which are popular with collectors of 1 24th scale miniatures. This new seasonal theme collection of paintings are available to but, please contact me for more information or see my Art In Wax Facebook Page where I will post more information on how to buy these pretty little paintings. I ship worldwide from Southend England.